Latest addition to the Combi-Cam product line is available inverted and perfect for drawer applications. 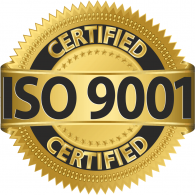 – Combi-Cam Ultra combination lock with key override and code retrievable capabilities offering convenient keyless access. 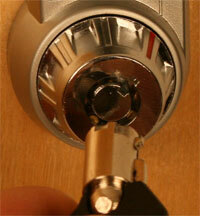 The secure heavy duty die-cast metal cam lock replaces any ¾” standard cam lock with 10,000 possible combinations. 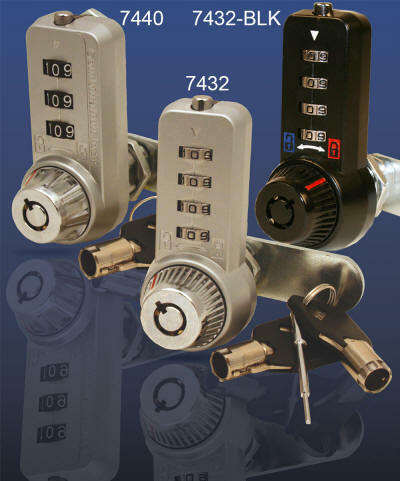 Combi-Cam Ultra, a combination door lock with key override, offers high security pick resistant keyways with over 50,000 possible key codes. The dual access lock with key override is user friendly – turn knob to open with no bulky housing to twist defacing surfaces. The Combi-Cam Ultra lock with key override is available in three cylinder lengths (5/8”, 7/8”, and 1-1/8”) and fits a maximum material thickness of 1-1/8”. 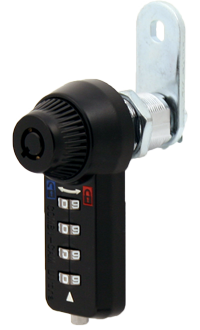 The combination lock with key comes with a 90 degree stop cam, 1-3/8” straight cam, ¾” cylinder nut and screw, and nut washer. Additional cams, finger pull, and metal locker handle available upon request. Master keys are sold separately. clear, distinct open and close indicators. Only the knob turns and not the entire lock housing. This is very important (if the housing is not circular)due to potential surface defacing. 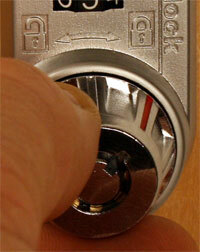 Key discovers the combination and lock can be reset = no throwing away the lock if the combination is lost! !